A Solitaire is a Classic and That is Why We Selected 10 Solitaire Engagement Rings Any Woman Would Wish For! A solitaire is a single diamond that is featured within a piece of jewellery like a ring. They make a lovely gift to give to someone on a special occasion like a birthday, anniversary or an engagement. When it comes to an engagement ring one of the most popular styles is the solitaire because it is very classy and elegant. 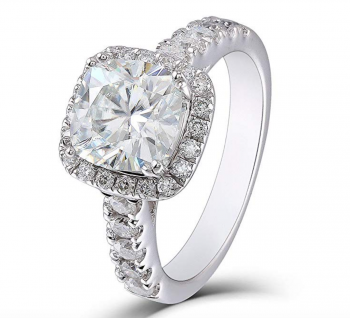 The ring also has the ability to showcase the beauty of one stone which we love! 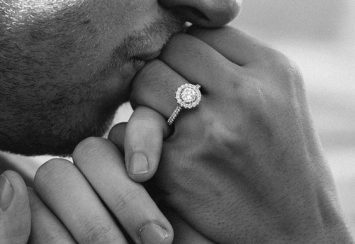 There is a common myth that a solitaire stone is a set shape however the diamond can vary in shape from a heart, pear, circular or square, as long it is one single diamond. You may not have realised but when it comes to the solitaire stone there are many styles available to choose from including a round brilliant, princess, cushion, pear and radiant. It’s correct to say that the round brilliant style is one of the most popular ones. 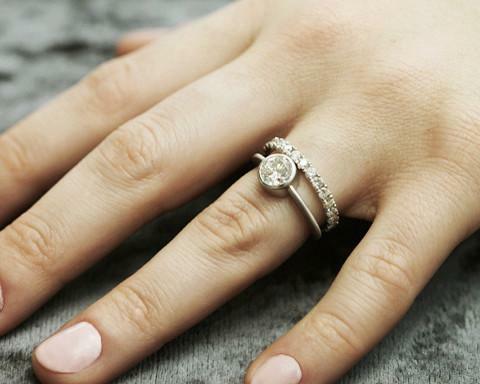 When choosing your solitaire ring the next thing that you’ll need to consider is the setting style which can consist of a bezel, prong, cathedral or tension. 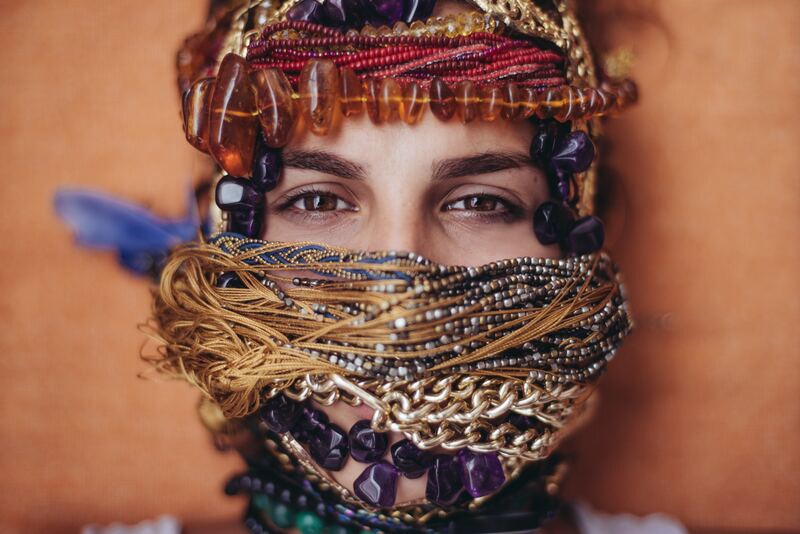 Our first option takes decorative jewellery to a new level! This stunning piece of statement jewellery is extremely detailed. At the centre of this ring you’ll instantly notice a beautiful excellent cut moissanite gemstone. To call this gemstone big is an understatement. It’s huge! Weighing in at an incredible 2 carats, this gemstone is sure to turn heads and it’s sure to sparkle. 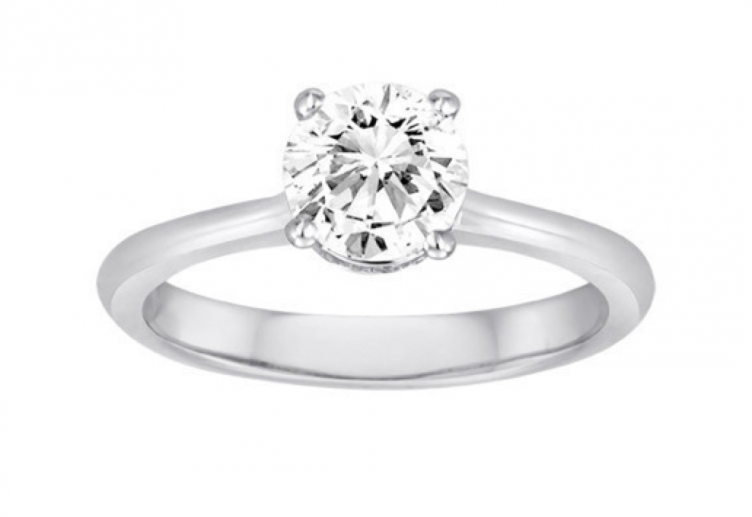 This round, brilliant moissanite is held in place with a simple 6 prong setting and really is elegant. That’s probably where simplicity ends with this ring and if you’re looking for an ornate item of jewellery then this is what you’re after! It’s impressive just how much detail has been included and there’s a lot to take in from any direction. Starting with the view from the top of the ring, you’ll notice that on either side of the enormous moissanite, the band of this ring features a selection of smaller moissanite gems which decorate the band. This certainly adds extra sparkle and complements the larger gemstone really well. From above you’ll also notice that it has a rather special band (also referred to in the title as ‘shank’). From above it looks as though the outer edges of the band/shank have been decorated in yellow gold, however upon closer inspection you’ll see that this is in fact the inner band/shank which is 14k yellow gold. This extra detail is clearly visible from above and is certainly a unique feature that you’re not likely to see on an average ring. This works really well with the large gemstone that sits in the centre and also looks fantastic alongside the platinum band. 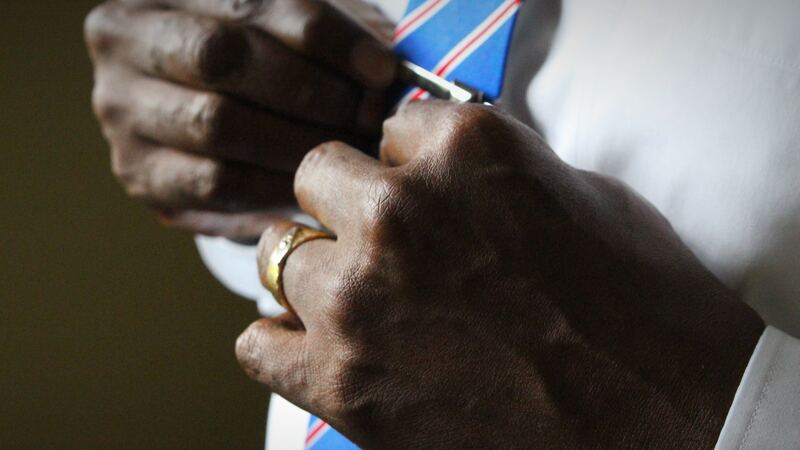 The platinum band also means that you’re getting a really hard wearing ring that will last the test of time. Perhaps the most intricate detail is visible from its side profile. 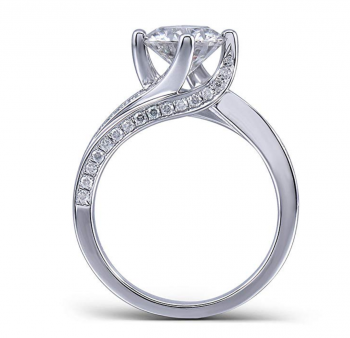 Here you’ll notice a stunning design which makes the most of the cathedral style ring. It really does look as though the band is held in place by these cathedral arches and on each side of the band the ornate arches make the ring look very special. 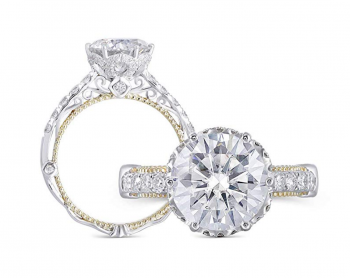 Additional moissanite gems can be seen at the top of the band where the arches meet and also half way along the band where the upper and lower shank meets. This is a lot of detail for one ring and we really could talk about this piece all day long! 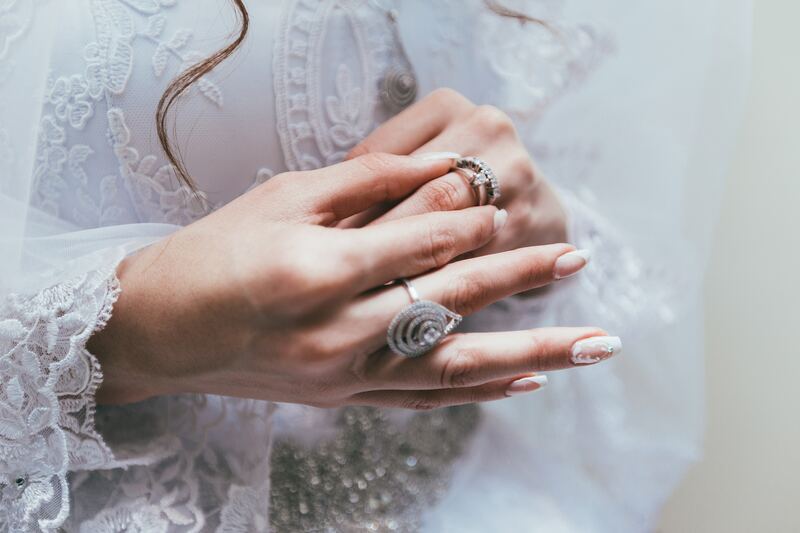 If you’re thinking that this is a little over the top for your style, we’d recommend taking a step back and looking at just how beautiful this ring is. Yes, it’s ornate and somewhat over the top. However it’s hard not to love the exquisite detail and the beautiful moissanite gemstone which is sure to sparkle. Don’t forget, moissanite is actually higher on the reflective index than a diamond so it may even out sparkle your diamond ring. From extravagant beauty to elegant simplicity. Our next ring is a classic design that is sure to match any style. It features a beautiful, round 1 carat moissanite gemstone. This is a really sparkly gem thanks to its very good cut and the gemstone looks fantastic from every angle. Held in place by a simple 6 prong setting, the gemstone is very attractive and works well as either an engagement or anniversary ring. You’ll notice straight away how simple the design of this band is. The band is a really nice thickness around the entire ring and it tapers in to a slightly thinner design as the band reaches the gemstone. This further helps to draw all attention to the large gemstone and the polished 14k white gold is a stunning backdrop to the moissanite gem. From the side profile there are actually some really intricate features within the design of the band. 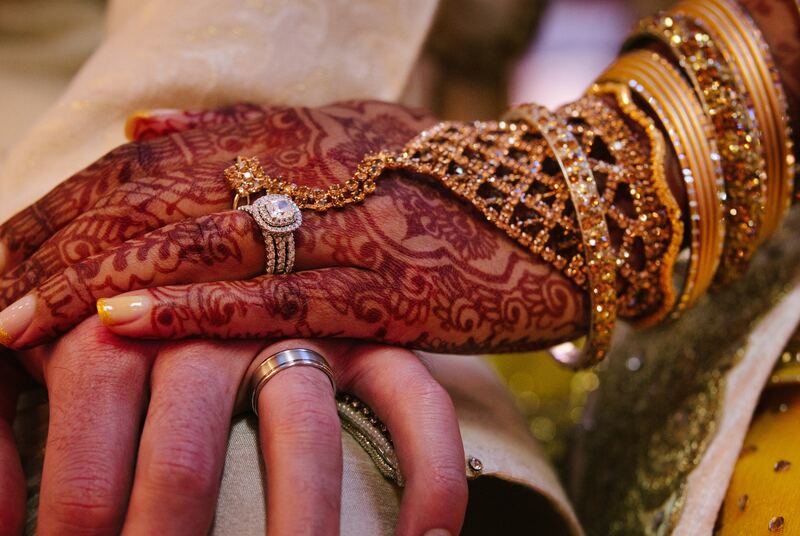 The band has been cleverly woven together at the top so that it looks as though the band is holding the gemstone within the palm of a hand, with the band effortlessly forming into the prongs that hold the moissanite gemstone. If you’re looking for a simple and elegant solitaire ring then this makes a perfect option for a very reasonable price tag. You’re getting a very pretty piece from a seller you can trust and your ring will even come with its own certificate of authenticity and lifetime brilliance warranty. 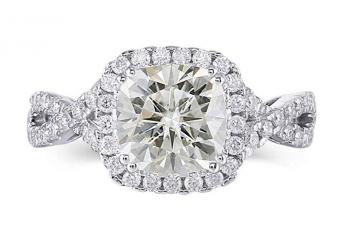 This solitaire piece promises a striking cushion cut moissanite gemstone weighing in at approximately 2 carats. 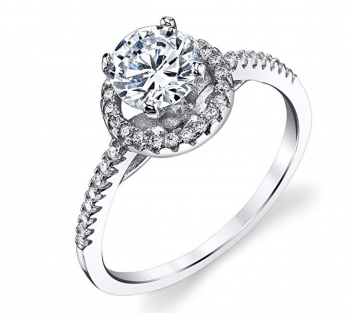 This gorgeous ring is a lovely statement piece that will look stunning as an engagement ring! The gemstone is held in place by a prong setting. One of the things we love about this moissanite stone is its lovely sparkle (it’s in fact known for a having a higher reflective index than a diamond). It looks more like a diamond than a moissanite. This stone’s cut is also classed as an excellent cut. You’ll notice that the gemstone is raised above the band which gives it quite a bit of height and an interesting structure when looking at the ring from a side view. To continue the sparkle, the designer has chosen to feature further diamonds positioned around the moissanite, effortlessly framing it. These smaller diamonds emphasise the gemstone in the centre as well as complementing it. These smaller diamonds continue along the elegant band. The main structure has been created using a sterling silver metal with thick rhodium plating that is white gold. The great thing about this material is that the sterling silver, which is 92.5% pure silver, makes the band super shiny and very smooth. The choice of material ensures that this piece doesn’t tarnish and is non-allergenic which is great to hear! 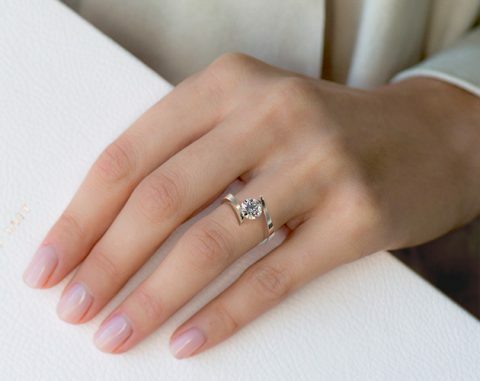 We love that this engagement ring is elegant, exquisite and looks beautifully bright! The piece of jewellery is being sold by DovEggs for a high price. This stunning ring comes in a cute jewellery gift box with a bow tied around it in a bag. 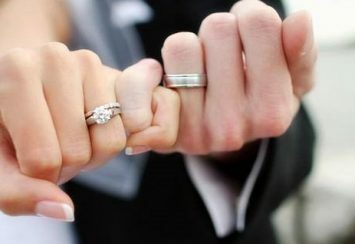 The engagement ring also comes with a lifetime warranty and certificate of authenticity. We love this ring and think you will too! If we we’re to rate this engagement ring out for 10 when it comes to the originality of the band, it would definitely be 10 out 10. This band that supports this moissanite stone is really something quite unique. What makes this engagement ring different is how this elegant band twists around gemstone, effortlessly holding the stone in place and that the end of the band turns into the prong, holding the gem in place. If you take a long look at it you’ll see that there has been a lot of thought and attention to detail put into the design of the piece. Another thing that enhances the twisting structure of this band is the use of small diamonds. These diamonds are positioned in a strip along the top surface of the rings band as well as the outer side edge, giving this engagement ring an interesting dimension and special detail. When it comes to the moissanite stone, this weighs approximately 1.5 carats and has been positioned securely in place by a prong setting. The gemstone has been cut into a round brilliant shape. As with the previous engagement ring, the gemstone has a wonderful shine to it. It has a reflective brilliance which means it has a higher than diamond reflective index, making it look more like a diamond than a gemstone. This piece is extremely sparkly which you’ll love from the second you put this ring on! The interesting band that holds this gemstone securely in place has been created using sterling silver that has been plated in platinum. What’s great about this combination is that the band has a stunning shine to it but is also very durable. What better combination – beauty and strength! What makes this option unique and utterly gorgeous is it’s decorate band that makes it stand out beautifully! This stunning piece has been crafted with an unusual band that consists of a platinum plated sterling silver base and small diamonds positioned in a crisscross strip along the band. These diamonds certainly bring a touch of sparkle to the ring in an effortless way. If you’re curious about the thickness of this band it is approximately 2.5mm wide. The combo of diamonds and silver really look great together. When it comes to the solitaire, this takes pride of place and the stones look breathtakingly gorgeous in the setting. 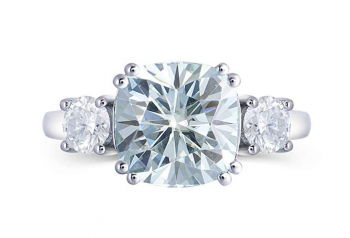 The stunning moissanite is held securely in place by a 6 prong setting that looks beautiful. The stone has been cut into a round brilliant shape and weighs approximately 1carat. What’s great about this stone is that it has been designed to maximize the brilliance of the moissanite so it looks more like a diamond. This is fantastic because it looks like the real thing when in fact you’re paying a fraction of the price! Upon arrival, this ring will arrive with a warranty and in a jewellery box so you know your ring is nice and safe. The solitaire moissanite takes pride of place in the centre of this ring. Approximately 9mm by 9mm round and weighing around 3.5 carats this cushion cut tinted stone grabs your attention straight away! It is also held firmly in place by a prong setting, making this piece look extremely elegant. Positioned either side of this stone are two smaller stones that are 4mm round, weighing in at approximately 0.25 carats each. The three stone positioned together alongside each other represent the past, present and future rings that we love so much. This ring is really one classic piece of jewellery that any lucky lady would be pleased to receive as an engagement ring. As with our other DovEggs rings this gorgeous piece has been created using a platinum plated silver. What we love about this is that the band is extremely smooth and shiny but it also very durable making it perfect for wearing on a daily basis. This is a very special piece that is being sold for a very reasonable price for what you’re getting in return. This engagement ring sold by Lemon Grass oozes sparkle! 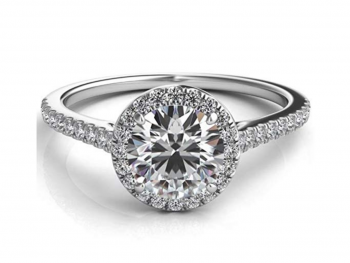 This pretty piece has been designed with a circular halo solitaire diamond in the centre of ring. You may mistake the stone for a real diamond but you’ll be surprised to hear that the ring contains a stunning cubic zirconia jewel which gives off a fabulous sparkle, making this it very special. When admiring the halo stone in the centre you’ll notice that it is framed by beautiful micro-pave diamonds that adds that extra touch of sparkle. . The foundation has been created using a stunning sterling silver material which has a rhodium plated finish to it. This not only ensures the engagement ring is super smooth and shiny but it also very durable and hard wearing which makes it perfect to wear on a daily basis. The band is also nickel free and hypoallergenic which makes it safe for people with sensitive skin to wear. To give you an idea of the size of this piece, the band is approximately 2mm wide and the circumference is approximately 54.4mm. A special touch that the designer has decided to include is the additional diamonds that cover the entire band of this ring. The continued sparkle work really well in complementing the cubic zirconia stone that makes up the centre stone as well as the micro-pave diamonds that encircle the centre gemstone. This option is being sold by Lemon Grass for a very low price. It will arrive in a leather jewellery box and comes with a 30 day money back guarantee. 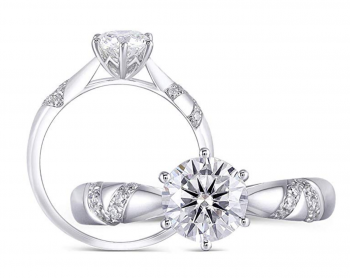 If you’re on a tight budget then this solitaire ring may be a great option for an engagement jewelry piece. Rather than diamonds this pretty ring has been designed using cubic zirconia stones. 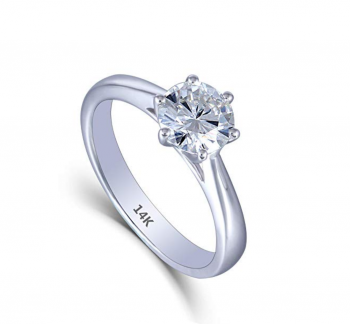 The solitaire stone positioned in the centre is held securely in place by a prong setting. It then features a hollow round circle around the solitaire stone. This has been covered in further stones which complement the solitaire stone beautifully. These small stones then continue along the band creating a sea of shimmer. For the price it really is very sparkly. The main structure has been created using a refined solid sterling silver which makes this piece of jewellery look very shiny to wear. The silver also has a thick anti-tarnish platinum rhodium overlay, protecting it. When it comes to the cubic zirconia jewels these have a brilliant cut to them and are top quality. The stones have also been hand set to perfection! If you’re not 100% happy with your ring the jeweller offers you a 30 day money back guarantee. If you’re looking for an option that has a modern style to it then this solitaire ring may be exactly what you’ve been looking for! The cubic zirconia has been cut into a rectangle shape where it has been held in place securely by a prong setting. It really makes you think of the jewel as a piece of glass because it’s extremely clear, reflective and shiny. We love how the cut of this stone gives it a super modern feel. To give you an idea of the size of the stone it is approximately 10mm wide and has been positioned in a micro pave setting. The cubic zirconia also has a triangle shaped stone positioned either side of the centre stone, finishing it off beautifully. The foundation has been created using a refined solid sterling silver metal that has an anti-tarnish platinum rhodium overlay to it making the band extremely shiny and durable. The design is effortlessly modern but has a classic feel to it which we love. It also comes with a 30 day return policy if you’re not 100% happy with your purchase, however we don’t think this will happen! This option is another piece that is being sold by Minxwinx for a very low price. 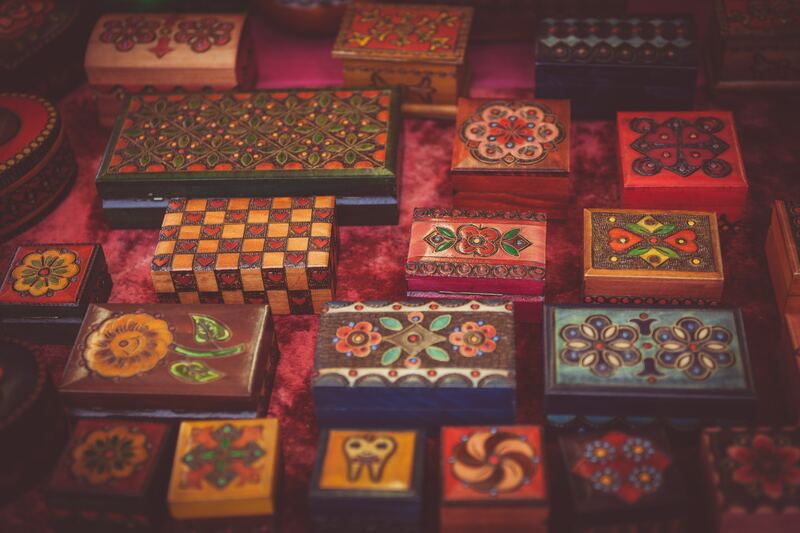 Take a look at their collection, you’re bound to find something you like! If you thought we saved the best to last you may be right on this occasion! Designers at DovEggs have really gone above and beyond with this stunning piece. It’s truly breathtaking you won’t know what’s hit you! To begin with the centre moissanite stone weighs approximately 2 carats and is approximately 7.5mm by 7.5mm square. If you’re looking for a stunning piece this is it! This centre stone definitely looks like the real thing – a diamond, so you’ll be surprised to hear that it’s made from a moissanite stone that has a yellow tone to it. The stone has been shaped to an excellent cut which makes the most of its brilliant shine! Smaller diamonds are then positioned around this centre stone, framing it beautifully. These jewels then continue along the band in a double line. The width of the band is approximately 2mm wide, which gives it plenty of space for the two rows of stones to appear. The main stone in this gorgeous ring weighs approximately 2 carats and has been set in a stunning prong setting. We think this option would make a fantastic engagement ring. It’s pretty, sparkly and modern. 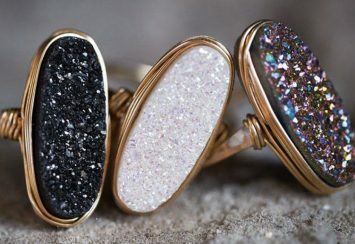 It will also stand out beautifully on your finger. Whoever receives this ring is a very special lady! What are the differences between the varieties of setting styles? Bezel – If you like a modern and sleek looking ring you’ll love the bezel setting. 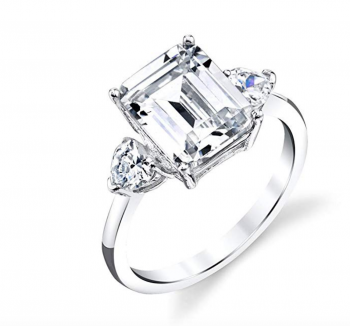 The metal completely surrounds the diamond in this ring by following the stone’s shape. 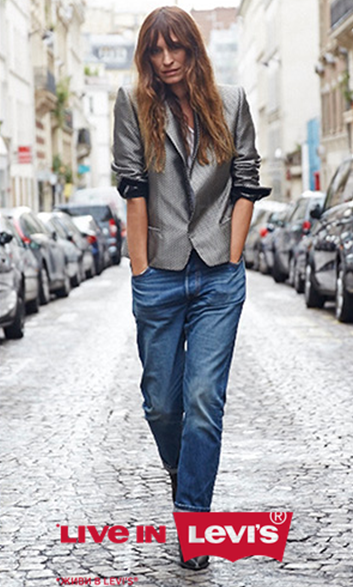 This style is perfect if you love your exercise and have a very active lifestyle. Prong – The prong offers a very minimalist style setting whereby the stone is held like a claw from beneath. The stone is held by prongs which are small wires that bind the stone. They are also welded to the rings band, ensuring its safety. 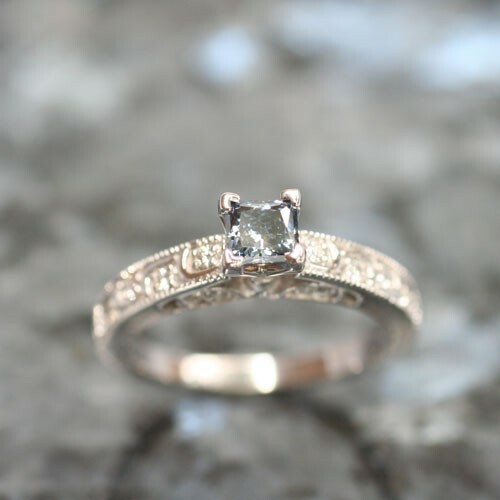 Even though they are held close in and protected, the stone is noticeably held up high above the band so it shows off its detail and the diamonds size, giving off plenty of sparkle! Cathedral – The cathedral setting gets its name from the aesthetic similarities it has to a cathedral. The setting makes the most of allowing the diamond to be very visible, with slopes either side of the stone, protecting it. Its sweeping nature is also very similar to that of the arches and vaulted ceilings you’d find in a church. Tension – This setting is known for having a unique appearance where the diamond looks like it is floating. There is no metal under the diamond which allows the stone to be cleaned easily. This is another fantastic setting which allows the ring to act as a spring that holds the diamond in place. The best way to check the quality of a solitaire diamond is by looking at the 4 C’s – clarity, colour, carat and cut. When it comes to clarity, the best type is flawless. For colour it is D. When the carat increases the value of the diamond does as well. Having an excellent cut provides the best proportions.